As we were just mentioning yesterday, we first highlighted ITUS in Thursday’s premarket report, and later that day we observed a low of 1.92. Friday and Monday both brought the recording of higher highs and higher lows, and yesterday followed suit. We watched as ITUS pushed upward once again, trading in a daily range from 4.00 to a new high of 5.15. It worked out to an intraday move of 29%, and an overall increase of 168% over the low we witnessed on the morning of our initial alert. For a stock that was already approaching $2/share when we came upon it, that’s a fantastic four-day swing. Speaking of higher priced stocks we’ve called that have made some impressive moves, we’re talking about IZEA again as well. We called it on Monday morning, and saw a move from 4.54 to a high of 6.35 (+40%) that day, and specifically reiterated our signal yesterday morning. Yesterday morning we noted the fact that AAPL was showing signs of a reversal and rebound after a selloff period. We mentioned that we’d radar the AAPL Weekly $150-155 Calls for quick-strike trade opportunities and our idea worked very nicely. $152.50 Calls – Range: 1.00-2.07 – Max Gain: 107%. 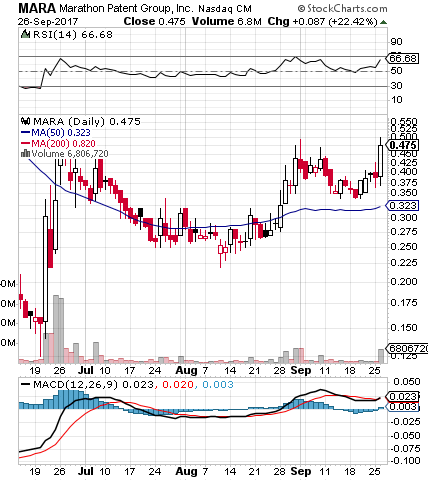 We also want to talk about MARA this morning, as we’re noticing an interesting chart setup currently in effect. The laast time we mentioned the stock was in July, and while we were a little early to party as it was still searching for a bottom, it didn’t take more than a few weeks for the stock to ultimately establish support and launch a rebound off a low of .22. Since that time, the stock has made a nice move to the tune of 127% as it reached a high of .50 this week. We’re going to look out closely for a potential breach of a previous resistance point at .56, after which the stock could see another leg-up. As you can see on the snapshot below, the MACD is executing a bullish cross while the RSI shows MARA about to break into the Power Zone. We keep going back to the well that is the PBR options chain, and almost never come up empty-handed. Just to recap this week’s action, we targeted the PBR November $16 Calls on Tuesday morning, and were promptly rewarded with an 35% intraday spike. On Wednesday, we commented on the real possibility of seeing more action in PBR options as the stock pulled back and rebounded, and it only took until yesterday’s session to see that prediction met. FLPC made a notable move right at the start of the session yesterday morning, opening up at .002 and rapidly running to .0027. That marked a quick chance at up to 35% in gains. We also tagged HKUP, and the stock would provide a series of intraday swings of which one could have taken advantage; the two main thrusts were from .006-.0072 (+20%), and .0062 to .0069 (11%). The overall markets took a pounding yesterday, and after a contrary performance by TSLA which managed a positive move, the stock is pulling back today to a premarket low of 240.56. As long as support holds at that range, we’ll be expecting to see a bounce. If that proves to be the case, we’ll need to identify a proper options trading target. Likewise, we’re looking for an upcoming bounce on the SPY which got drudged down along with the market yesterday. We may have an interest in trading SPY Calls, and should be ready for a rebound to come at any time. We want to quickly make a note of SPIR as well. The stock fell to new 52-week lows yesterday; we always like to monitor plays like these for potential bottom bounces. We’ve lost count of how many times we’ve called PBR correctly, but it has become a weekly, if not daily, sort of occurrence. If you recall, our report on Friday included a note proclaiming our interest in the “August 22nd $15.50 and $16.00 Calls for a swing trade into next week.” Already that prediction has begun to materialize in a big way. PBR blew past $16 and even breached $16.50 during Friday’s session, and our target contracts both saw sizable increases. The 08/22 $15.50 Calls ran 73% in a range from .68-1.18, while the $16 Calls went from .44 to .79; a 79% jump. The Weekly $16 Calls which have been a focus in each of the past few weeks, while a more risky proposition, yielded the highest potential rewards. Those ran from .05-.50 on the day; a 900% spike. This morning in the pre-market, PBR has already traded as high as $17, so it will be interesting to see how much higher our potential gains on this idea will go. The first thing we’re looking to do this morning, is take enough profit off of the table to lock in our initial investment, then ride the rest of the way on the house’s money. We’ll also be observing the overall temperament of the stock as we begin a new trading week, and will be forming further strategies as we go, so stay tuned! For a limited time only, we are inviting our readers to experience a free trial of a LIVE Trading Chatroom complete with media and screen-sharing, Live Level 2 Snapshots, VWAP Charting, and the input of a seasoned group of veteran traders. This normally exclusive room is being opened to our subscribers for only a short time, and space is limited. Once capacity is reached, that’s it, so grab your free trial and get in on the action today! We hope everyone enjoys the second half of this short day and tomorrow’s day off from the markets, no matter what your background, or how you celebrate the season. Year’s end is always a reflective time, when we sit and ponder both the year past and the one to come, and get a chance to recharge our batteries. However, before we settle in for a long winter’s nap, let us take the time to congratulate ourselves for squeezing in yet another big winner to Friday’s watchlist. We included RXAC in Friday’s watchlist after noticing that the company was reactivated by Florida’s secretary of state office per a filing dated Dec.19th. After opening at .006, the stock touched a low of .0042 before running hard into the close and finishing out the day at the HOD of .0099 for a intraday gain of 136% It was the largest gainer from an Extended Watchlist that included 5 out of 6 stocks that posted gains on the day. AAPL was the one exception, however it appears that it wants to gap up and go green as well today. This is the time of year when lots of folks are selling out of their positions to take a tax loss, which creates great opportunities for bottom-feeders. We will on the lookout for bounce plays, and any other opportunities that may come our way. We will be releasing a new pick on Wednesday that fits into the ‘bottom-bouncer’ category, so be sure to tune back in immediately following the holiday, when we will be ready to ring in the New Year with a bang. KWBT proved to be good for a quick flip right out of the starting gate following yesterday’s alert. Trading as low as .0025 in the first ten minutes, the stock pressed as high as .038 by 11:30, marking a gain of as much as 52% in just the first two hours of the session. It went on to make a couple of other bounces throughout the day, one from .0024-.0031 (29%), and another from .0021 to .0026 (24%). In total, on the day of our first mention of KWBT, there was a chance to compound profits in excess of 105%. Not too bad at all for our first day of coverage, granted the fact that many of our picks can take days or even weeks to offer up chances for gains of that magnitude. What we have above on the chart, is a descending wedge pattern, which can foreshadow a big run, provided the stock breaks through key resistance at the 20DMA of .0028 and the 50DMA of .0031. SNTL is looking like it is building toward a strong start to 2013, with a Golden Cross of the 20DMA over the 200DMA in progress on the chart, and the stock continually making higher lows and higher highs as it stair-steps its way up. We’ve also observed a drastic volume increase this week, as new investors accumulate at higher levels. Apart from the ripening chart below, take notice of the press release from Tuesday, as the company announces its expansion with a new subsidiary that will be focused on the sales and distribution of its renewable energy generation equipment. Syncronys International, Inc. announces formation of a wholly owned subsidiary Lectric, Inc. a Nevada corporation. The Company is pleased to provide shareholders with a yearend update as well as outline certain goals for 2013. Lectric Power will be focused on sales, distribution and installation of a wide range of green energy products and applications. These will include Micro Utility, Micro Grid, and Smart Grid both domestically and internationally. Additionally Lectric Power will sell and distribute power generation equipment for use in commercial, home and agricultural applications and solutions.